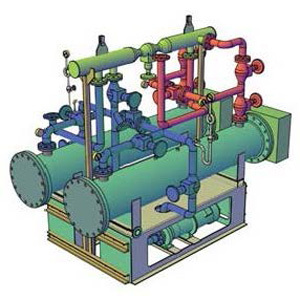 Dove Thermal Engineering designs and builds BoP skids for chemical process sidestreams and environmental control plant, power generation and boiler plant services equipment, and for marine propulsion and ancillaries. 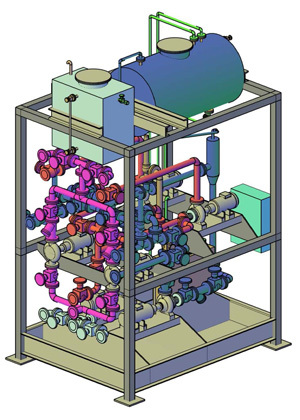 We provide professional engineering services in all thermally-related topics. The modular Balance of Plant concept emerged in the marine industries during the early 1960s, with companies such as Rolls-Royce, Serck Heat Transfer and Coventry Radiator pioneering drop-in electromechanical BoP packages. Marinized BoP skid mount generating units - along with fuel oil conditioning, lub oil cooling and filtration balance of plant skids - could be installed during fit-out, and exchanged from the dockwall on a single tide. This anticipated the automated engine room, and present day ship management practices. More recently, similar packaging concepts are being used to provide central services for site-based environmental control plant. Dove Thermal has been designing and building Balance of Plant modules for over thirty years. The advantages of bringing together all services necessary for a core application are of particular value in the pre-engineering of complex systems, when site access is in some way restricted, or when installations are to be made at remote worksites. We hold the DTI's award for Excellence in Design Engineering and Project Management and were engineering design consultants to the MAS and DAS for their duration. Production plant, process acceleration & product design are core activities. Our pages on liquid phase HTF and hot oil heating plant give examples of packaged BoP skid mounts installed into confined areas within factory environments (above). The compact arrangement of balance of plant skids allows safe and secure operation of service equipment adjacent to attended manufacturing machinery. 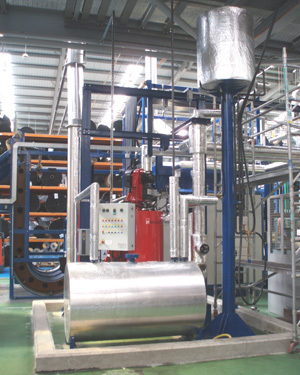 Believed to have been applied initially to power generation and boiler plant, the concept extends to modularized test plant ancillaries, chemical process sidestreams and marine propulsion equipment. From a contractual viewpoint, a BoP skid mount service module places responsibility for the supply and commissioning of bought-in equipment with a single source, whilst in terms of project management, the component count of deliverables is much-reduced. Having regard to integrity of supply, the transport, storage and security of a single item is more readily arranged. As given above, they are widely employed in managing electromechanical BoP requirements and related applications. 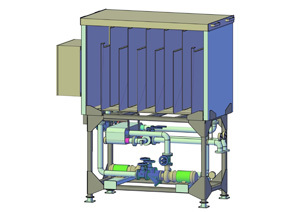 Dove Thermal has originated and developed a range of skid-mounted coolant management modules to optimize chiller ratings for variable load conditions and batch-continuous processing. The isometric shows one of the Balance of Plant modules that we designed for a packaged turbine generator. These BoP skids brought together pumpsets and heat exchangers, oil & water tanks, and environmental control plant, with local panels, variable speed drives and prefabricated wiring looms. We have designed and built BoP Skids to package various types of chemical process sidestreams and electromechanical BoP requirements.